This picture is just showing a few of the advantages peculiar to the GRAFT platform, i chose it because i just want whoever sees it to know that they are going to save time via real time authorizations and save money via absence of credit charges. once internet of things has now become internet of value. processes and so transactions can take a while. in the internet of values but the issue is actually encouraging people to adopt and use it. Now this is GRAFT comes in. GRAFT (Global Real-Time Authorizations and Funds Transfers (GRAFT) is as the name implies "a global, opensourced, blockchain-based, decentralized payment gateway and processing platform that anyone can use". Now i know you might say "we already have a lot of cryptocureency platforms and all that" but GRAFT is not other platforms , it is here to improve the face of crypto-currency transactions. Now as a platform is introduced , the initial users enjoy high speed transactions but after a while, the transaction speed begins to slow down and we blame the internet but the truth is that most of these platforms don't have very high scalability. network is capable of 56,00 tps while bitcoin says it has a rate of 7 tps. With GRAFT , the issue of low scalability is adequately tackled. One of the ways is the reduction of block creation interval to two minutes and another is removing the size limit on blocks so that they can accomodate more transactions. in time, so they can accomodate any fluctuation of activities on the platform. , this can cause downtime and when that occurs, transactions will go missing. GRAFT can assure you of a very high level of security for you money and privy information. First of all, the escrow service is used to make sure funds are only released when terms of a transaction have been met. Identity proofing will be highly implemented to ensure that merchants are selling goods to elligible customer especially stuffs like drugs or guns or the customers to make sure that they are buy goods that are not stolen or compromised. GRAFT is equipping the supernode with identity verification and fraud detection resources to make sure the integrity of the payment network is not compromised. GRAFT will also be enabling auxillary business logic like drug interactions or loyalty rewards. Authentication tools like multifactor authentication which includes biometrics, FIDO and other passwordless tools to reduce event of lost keys. Effective identity and authentication ensures secure, quick and reliable payment solutions. Merchant tokens are used to create private tokens for the owners. GRAFT merchant token does not need any programming so its easy to create. Merchant tokens will allow users to create and use entities like loyalty rewards, gift certificates or store credit programs without any fees or registration. Vchain (virtual chain and virtual blockchain). Virtual chain in the sense that it facilitates the creation of multiple points of sale to access a particular private blockchain. Virtual blockchain in sense that it provides a platform for creating and managing the creation of the merchant tokens and a chain of multiple stores for the same merchant. Now you don't have to worry about interest rates and registration fees because any fees to be paid will be settled by the merchant. Transactions processing at the speed of light with real time authorizations. The aim of GRAFT is to make transactions as instant as possible. 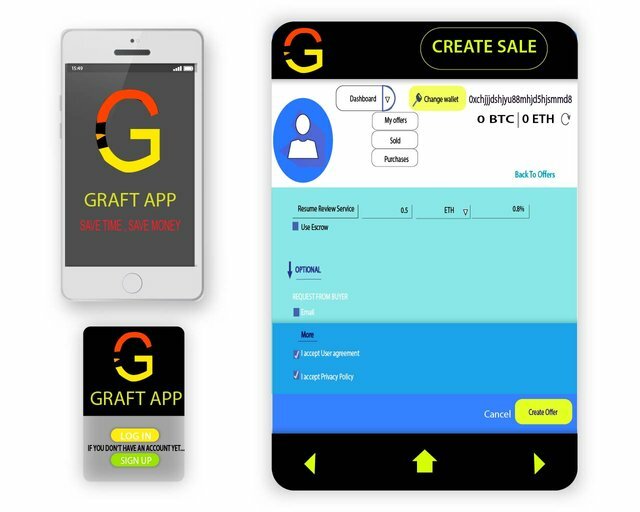 This Graphic shows how Graft app could look like and i chose the design to chow how GRAFT is willing to make customer life easier by allowing them to perform transactions on the GO. This post has been submitted for the @MediaWorks Sponsored Graphics Contest!